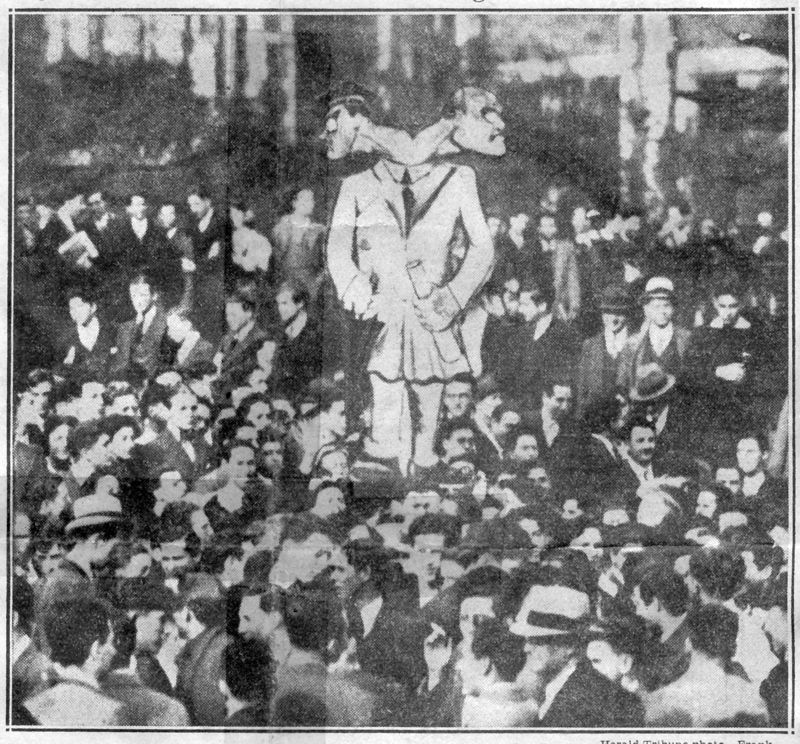 This photograph from a November 20, 1934 rally at City College (CCNY), features a student-made, two-headed effigy of CCNY President Frederick B. Robinson and Italian Prime Minister Benito Mussolini. After being paraded around campus throughout the morning's demonstration, the seven-foot-tall cardboard piece was burned amidst student cries of "Smoke Robby out." The event was held to demand the reinstatement of twenty-one expelled students as well as the removal of Robinson. The twenty-one were expelled following an anti-fascist rally on October 9th. The expulsions were not the first issued by Robinson who regularly faced accusations of stifling free expression from left-leaning student groups and organizations. Robinson's effigy depicts him in academic regalia grasping the umbrella with which he struck students at a rally in the prior year. Cite This document | Herald Tribune, “Twin Effigy of President Robinson and Italian Premier Mussolini at Protest,” CUNY Digital History Archive, accessed April 21, 2019, http://cdha.cuny.edu/items/show/4062.